Dr. Annie Page-Karjian DVM, PhD !!!! Congratulations to Dr. Mauricio Seguel, who successfully defended his PhD. Mauricio is now a post-doctoral scholar in the laboratory of Dr. Vanessa Ezenwa of the Odum School of Ecology ! Congratulations to Kaylee Arnold who received an 2017 Innovative and Interdisciplinary Research Grant from the UGA Graduate School and the Odum School Small Grant ! Dr Nicole Gottdenker participated in field work at oil palm plantations with lab alumni Diana Erazo. Their work focus in the role of human modified landscapes in the dynamics of vector borne diseases. Dr. Odsuren Sukhbaatar, an MD from Mongolia doing her PhD at the University of Nagasaki Institute for Tropical Medicine, just spent a month with us doing a laboratory rotation. She helped us set up a leishmania ELISA diagnostic assay in domestic dogs. Welcome to Alejandra Millan, our new research technician! We are so happy to have her on board to help us get it done! Welcome to Kaylee Arnold who is our newest doctoral student in Interdisciplinary Disease Ecology Across Scales (http://ideas.ecology.uga.edu/) program, She will be co-mentored by Dr. Michael Strand. Wecome Alexandra Catano, a visiting undergraduate biology student from EAFIT University in Medellin, Colombia. Alexandra will be working alongside Drs. Nicole Gottdenker and Mauricio Seguel. Dr. Jusun (AKA 'Liae' Hwang) successfully defended her PhD on the disease ecology of feral cats in April 2016, Congratulations, Jusun!! We wish the best for Dr. Annie Page, PhD 2015, who just started her new position as an Assistant Professor/Research Scientist at the Harbor Branch Oceanographic Institute! Congratulations to Mauricio Seguel for his Morris Animal Foundation fellowship for the project "Host and Environmental factors driving hookworm induced mortality in an isolated fur seal population"
Congratulations to Christina Varian for obtaining a Fulbright scholarship for her studies in Panama to study food webs in Attalea palms in relation to Chagas disease vectors in changing landscapes!!! Congratulations to Christina Varian for receiving and Interdisciplinary and Integrative Research Grant from UGA Graduate School! Congratulations to Mauricio Seguel for receiving a UGA Graduate School Dissertation Completion Award! Welcome undergraduate Honor student Susan Brands and PhD student Diana Erazo from Los Andes University in Bogota, Colombia to the Gottdenker Lab! Congratulations to Jordyn Whitfield, who was just accepted into the University of Georgia, College of Veterinary Medicine, Class of 2020! Mauricio Seguel passes all parts of his American College of Veterinary Pathologists Examination and is now a Board Certified Veterinary Pathologist! Congratulations, Mauricio! Christina Varian receives 2nd place graduate student poster in the UGA Science of Veterinary Medicine Research Symposium. Congratulations to Christina Varian, who has received a National Geographic Society Young Explorers award to work on the impact of anthropogenic land use change on food webs of Attalea palms in relation to Chagas disease transmission!!! Mauricio Seguel has received a grant in aid-of-research from the Society for Marine Mammalogy! Nicole Gottdenker, Christina Varian, and Karen Wu are traveling to Panama this summer to collect data and samples for their ecoepidemiology project! We welcome Karen Wu, 2nd year veterinary student and Georgia Veterinary Scholars Program Summer Scholar. She will be working with us on our collaborative UGA/CDC/Gorgas ecoepidemiology project using domestic dogs as sentinels for Chagas disease and leishmaniasis across land use gradients in Panama. We also welcome Natalie Ryan Winn, independent study student, and Alison McWhorter Anderson, CURO Honors fellow, to the lab this summer! UGA CURO Honors Fellow Jordyn Whitfield is back in the lab after a Maymester in Australia and New Zealand! 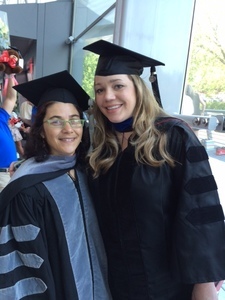 Annie Page-Karjian successfully defended her PhD and graduated this May! She is now DVM, PhD! (or Dr^2) Congratulations Annie! Annie Page-Karjian was awarded the Dennis Sikes Award for Experimental Pathology! In collaboration with Drs. Julie Velasquez Runk and Dr. Susan Tanner (anthropology), Dr. Susan Wagner Robb (public health), Caitlin Mertzluff (grad student in geography) the GRASP program at CDC, and the Parasitology Dept. of the Gorgas Institute, Panama, our lab received a 2-year collaborative UGA-CDC Seed Grant for our project: "Integrating Anthropology, Ecoepidemiology, and Veterinary Science to Define Drivers of Vector-Borne Zoonotic Disease Transmission in Changing Landscapes". In this project, we will use domestic dogs as sentinels for Trypanosoma cruzi and Leishmania infection in human communities across a gradient of landscape disturbance. Congratulations to Mauricio Seguel for receiving a Sigma Xi Grants-in-Aid of Research Award to study disease ecology of South American fur seals and hookworm infection on Guafo Island, Chile! Congratulations to Christina Varian for receiving a Sigma Xi Grants-in-Aid of Research Award to work on food web structure of the Attalea butyracea palm in relation to the Chagas disease vector Rhodnius pallescens! Annie Page-Karjian won 3rd place in the student poster competition at the 2014 Annual Conference of the Association of Amphibian and Reptilian Veterinarians with her poster, Severe disseminated fibropapillomatosis in a rehabilitating loggerhead sea turtle. Congratulations to Annie Page-Karjian and her husband Paul on the birth of their baby boy Noah! Annie Page-Karjian is featured as an Amazing Student on the UGA web page! Check her out at http://uga.edu/amazing/profile/page-karjian-annie/ ! Darlisha Owens from Grambling State University and Nick Means from Oklahoma State University worked with us on this summer as part of the NSF Population Biology of Infectious Disease Program in collaboration with Dr. Travis Glenn and Troy Kieran of Environmental Health Sciences.They worked on developing next generation sequencing techniques for the detection of blood meals and pathogens in kissing bug reservoirs of Chagas disease. Carmen Mancia, a veterinary student at St. George's University, was a Georgia Veterinary Scholar with us this summer, working in collaboration with Dr. Annie Page-Karjian on detecting environmental transmission of fibropapillomavirus in green see turtles. Nicole Gottdenker and Christina Varian traveled to Panama and Christina got started on her first season of doctoral field work investigating food webs in Attalea palms working with the Gorgas Memorial Institute and the Smithsonian Tropical Research Institute. Mauricio Seguel traveled to the Marine Mammal Center in California, to do necropsies on marine mammals. Annie Page-Karjian won 1st place and a travel award in an abstract competition hosted by the UGA Student Chapter of the Wildlife Disease Association. An article co-authored by Annie Page-Karjian, Development of genomic resource for a thraustrochytrid pathogen and investigation of temperature influences on gene expression, has been published in Plos One!! Mauricio Seguel wins Best Poster Award at Veterinary Research Day at the UGA College of Veterinary Medicine! Christina Varian and Mauricio Seguel both receive LACSI Graduate Student Travel awards to do their research. Congratulations! Nicole Gottdenker traveled to Brasilia to attend the 1st International Worskhop on Anthropization and Vector Borne Disease in Amazonia: Chagas disease as a Model System. Jusun (AKA 'Liae') Hwang moved back to Korea to start her field PhD research on feral cat disease transmission in urban ecosystems. Annie Page-Karjian won the Best Student Poster Award at this summer's Annual International Conference of the Wildlife Disease Association! Christina Varian received the Short Term Fellowship with the Smithsonian Tropical Research Institute! Annie Page-Karjian received an AAZV Wild Animal Research Fund Award to fund her research project, Investigating chelonid fibropapilloma-associated herpesvirus in symptomatic and asymptomatic infected green sea turtles! We are very proud of you, Annie! Congratulations, Annie Page-Karjian, for receiving a UGA Travel Award to attend the 2013 Sea Turtle Medicine and Rehabilitation Workshop at James Cook University in Australia! Congratulations to Mauricio Seguel for receiving the IAAAM (International Association of Aquatic Animal Medicine) Travel Award to attend their meeting and present his work on fur seal disease! Way to go Annie Page-Karjian, for winning a Sigma Xi Grants-In-Aid of Research Award to study fibropapillomatosis in sea turtles! Carolina Cabrera from Kalamazoo College worked with us on this summer as part of the NSF Population Biology of Infectious Disease Program. She modeled effects of acquired immunity on Chagas disase transmission. Nicole Woller worked with us as part of the Georgia Veterinary Scholars Program on urbanization and disease transmission in raccoon populations. Congratulations Jusun Hwang for winning the Best Graduate Student Poster Award at the Meeting of the Southeastern Branch of the American Society of Microbiology! Congratulations to Christina Varian for winning the Best Graduate Student Poster Award at the University of Georgia College of Veterinary Medicine Research Symposium! Mauricio Seguel and Christina Varian joined the lab. Welcome! Congratulations to Ronke Olojowesiku, honors undergraduate student, for receiving a CURO 2012 Summer Research Fellowship! Ronke will be studying the ecology of Chagas disease in Panama. Congratulations to Jusun Hwang, PhD student, for receiving a grant from the American Museum of Natural History and the Edward J. Noble Foundation for raccoon parvovirus research on St. Catherine's Island!! Congratulations to Karen Christ! Karen, a former undergrad student in the lab, has been accepted into UGA College of Veterinary Medicine's class of 2016. Way to go, Karen! Congratulations to Ming Fung, MS student, for winning second place in the oral presentation category of the UGA 2011 Science of Veterinary Medicine Symposium! Annie Page-Karjian joined the lab.﻿ Welcome!